To be hopeful in bad times is not just foolishly romantic. It is based on the fact that human history is a history not only of cruelty, but also of compassion, sacriﬁce, courage, kindness. What we choose to emphasize in this complex history will determine our lives. If we see only the worst, it destroys our capacity to do something. If we remember those times and places — and there are so many — where people have behaved magniﬁcently, this gives us the energy to act, and at least the possibility of sending this spinning top of a world in a different direction. And if we do act, in however small a way, we don’t have to wait for some grand utopian future. The future is an inﬁnite succession of presents, and to live now as we think human beings should live, in deﬁance of all that is bad around us, is itself a marvelous victory. 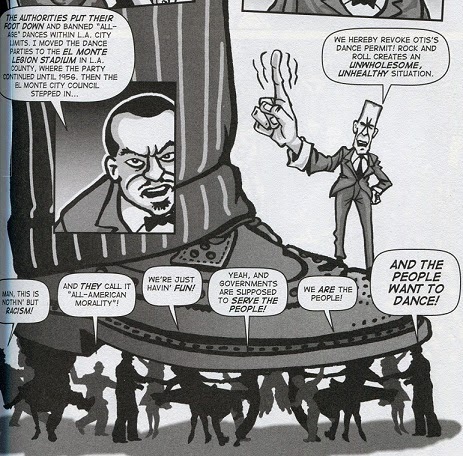 A People’s History of American Empire is more or less a graphic adaptation of Howard Zinn’s renowned A People’s History of the United States. However, its focus is more narrow — it’s specifically about war and imperialism throughout American history — and it combines Zinn’s history with material from his memoir You Can’t Be Neutral On a Moving Train and from essays and speeches he wrote over the years. The framing device is Zinn’s participation in an anti-war rally just before the invasion of Iraq in 2003. 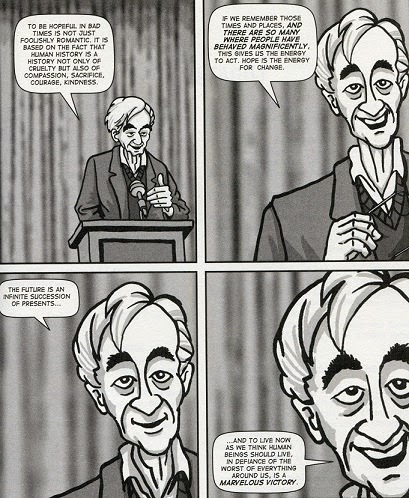 For the remainder of the book, a cartoon Howard Zinn, along the lines of Scott McCloud in Understanding Comics, guides us through history and makes connections between the past and the present. Much like watching Pride, reading Howard Zinn was my response to the recent UK General Election and the political despair I nearly slipped into for a few days afterwards. In addition to reading this comic, which I already had on my TBR pile, I also ordered Zinn’s memoir and watched the 2004 documentary based on it. 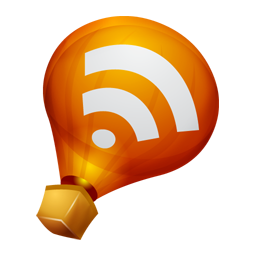 All this to say that in this post I’m likely to swerve into general musings about reading Zinn and what it meant to me at this moment in time, rather than stick to reviewing the comic properly. Don’t say I didn’t warn you. I adore the title You Can’t Be Neutral On a Moving Train: it’s another way of saying “the status quo isn’t neutral”, a phrase I keep returning to in my work and in my life. Zinn’s approach to history reflects this knowledge: as he explains, there’s no such thing as a value-free account of history. Choosing a perspective or a set of facts to emphasise is a choice informed by assumptions about what is or isn’t important. This matters not only because it determines whether we do the past justice, but also because the stories we tell shape our relationship with the present. History is full of examples of non-conformity and dissent; of hard struggles won against the odds; of losses that nevertheless paved the way for future victories. If these are written out of historical accounts, then we’re more likely to feel powerless, when in reality the history of progress is a series of examples of why fighting against injustice is worthwhile. “History is instructive”, Zinn says. With this in mind, he recounts the history of the massacre at Wounded Knee from the point of view of the Oglala Lakota; of the Ludlow massacre from the point of view of the striking miners; of WW1 from the perspective of conscientious objectors; of the post-war years from the point of view of the musicians who challenged racial segregation. In all these examples and more, the shift in perspective matters. We’re told that history is written by the victors, but who are the victors in the long-run, and how are we defining victory? 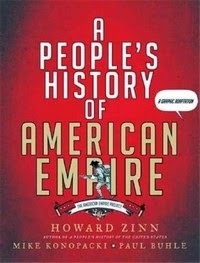 I also really enjoyed the more personal sections of A People’s History of American Empire, in which Zinn talks about his own life and how he came to be involved in activism. He tells his story in a way that challenges our common understanding of the individual hero doing the right thing due to superior courage and moral conviction. Not that Zinn lacked any of these — it’s just that time and again he reinforces the importance of collective action. Progress doesn’t come about through the actions of individuals who are superior to the rest of us, but rather through many small actions that become possible when resources are made available to people. Lasting change happens when people come together; when they act in solidarity and support one another; when they contribute in whatever small or large ways they can afford to and allow all these individual actions to “become part of a much, much larger sort of flow of energy”. It can be anything from writing a letter to joining a strike to cooking a meal for Civil Rights activists even if you yourself can’t risk your job by joining a sit-in, as Miss Bell so movingly does in Jacqueline Woodson’s Brown Girl Dreaming. It matters, all of it. It adds up to something much bigger. I would encourage people to look around them in their community and find an organization that is doing something that they believe in, even if that organization has only five people, or ten people, or twenty people, or a hundred people. And to look at history and understand that when change takes place it takes place as a result of large, large numbers of people doing little things unbeknownst to one another. And that history is very important for people to not get discouraged. Because if you look at history you see the way the labor movement was able to achieve things when it stuck to its guns, when it organized, when it resisted. Black people were able to change their condition when they fought back and when they organized. Same thing with the movement against the war in Vietnam, and the women's movement. History is instructive. And what it suggests to people is that even if they do little things, if they walk on the picket line, if they join a vigil, if they write a letter to their local newspaper. Anything they do, however small, becomes part of a much, much larger sort of flow of energy. And when enough people do enough things, however small they are, then change takes place. This gives me hope — the kind of hope that’s essential to me right now. Ooh thanks for putting this on my radar. I adore Zinn's work. It certainly helps me deal with the despair I feel about things happening in the world. I ordered his memoir when I was like 20 pages into this. I can't wait to read more of his stuff. I read the original A People's History in my AP history class, lo these many years ago, and even though I know there's a lot I didn't retain (I fell asleep during the GOD it was so boring robber barons' chapter SNOOZE), the conceptual framework of the book had a lasting impact on the way I think about history. Howard ZINN. the status quo isn’t neutral is heartstopping genius. Do you remember where you originally pulled that from, or is it Zinn? I have a copy of People's History that I really, really need to read. It's luckily on my shelf, so that may happen soon. That last bit you talk about—it actually really reminds me of Greg Proops' current podcast, The Smartest Man in the World. He's very left (and very feminist, although it's a little more 101 and cisgendered language-involving than I want) and he spends a lot of the podcast talking about terrible things that are happening in the world. But he always takes time to tell people that what they need to do is join a group or organization to make a little change. All those pebbles add up. It's how it works. And yes, absolutely. It doesn't always feel like it, but they do.